As part of WordCamp Milwaukee 2014, Kevin joined approx­i­mate­ly one dozen oth­er WordPress pro­fes­sion­als to cre­ate a web­site for the Milwaukee area non­prof­it My Sista’s KeepHer. My Sista’s KeepHer was cre­at­ed to inspire and encour­age young girls to love them­selves and each oth­er through the art of self expres­sion. Prior to this “Hackathon” event, the orga­ni­za­tion didn’t even have a domain name. 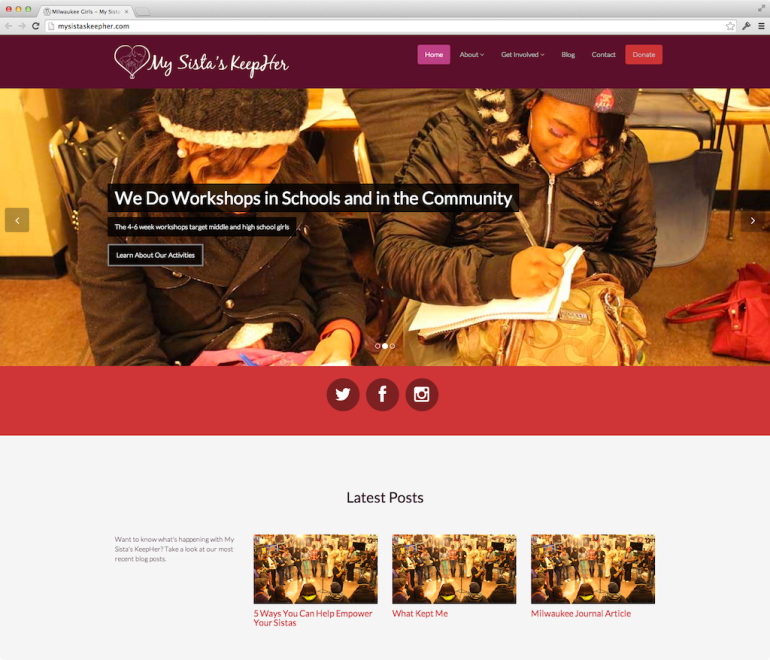 After two days of intense design, pro­gram­ming and con­tent cre­ation, how­ev­er, the all-vol­un­teer team had pro­vid­ed this non­prof­it with a pro­fes­sion­al web­site oper­at­ing on the WordPress Content Management System (CMS). This sample originally was published to portfolio.kevinabarnes.com on August 4, 2014.